If you wear makeup, the odds are that you regularly use eyeliner, especially if you wear mascara or eyeshadow. Without eyeliner, a look can easily look incomplete and sloppy. However, not all eyeliners are the same. Some are incredibly hard to use and not very accurate, while others smear or come off after only a few hours. We reviewed dozens of eyeliners to help you choose the best of the best. We considered ease of use, duration, smudge-proofing, accuracy of application, cost-effectiveness, customer reviews, waterproofing, and size. For accuracy and staying power, this eyeliner can’t be beaten. After reviewing dozens of products, the Maybelline Eyestudio Master Precise All Day Liquid Eyeliner Makeup stood out to us as the best. It features a small, accurate tip that makes applying all styles of eyeliner very easily. It is also smudge-proof and stands up to water and sweat. If you regularly use eyeliner, the Maybelline Eyestudio Master Precise All-Day Liquid Eyeliner Makeup is the one to get. It has a super-fine, durable tip that makes applying all styles of eyeliner easy. The tip is especially helpful for winged eyeliner because the tip is extremely accurate, making it easy to create symmetrical wings. This eyeliner uses liquid, but is not prone to smudging and designed to be worn for up to 12 hours. It also stands up to all-day wear so you won’t have to continuously apply as you go through your day. Plus, it is also waterproof but can be removed with a makeup remover. It is suitable for everyday wear as well as special occasions. While the particular eyeliner we feature here is black, there are also brown and blue options that are designed exactly the same. If black isn’t your thing, one of these is sure to be fitting. 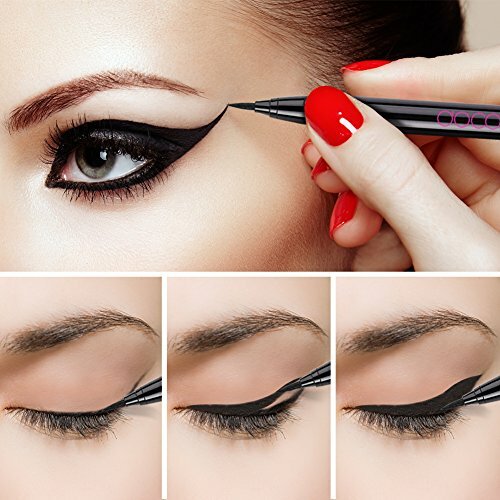 You can also change the amount of liquid the eyeliner contains. You can save money by choosing the larger pen, which costs just as much as the smaller one. This eyeliner takes a very long time to dry out so choosing the bigger option should not cause you to waste any. To prevent allergic reactions, this eyeliner is fragrance-free, an ophthalmologist and dermatologist tested. It is safe for your eyes and your skin. If you prefer a pencil eyeliner, you should give this one a try. For long-lasting, fade-proof eyeliner, you can’t beat L’Oréal Paris Makeup Infallible Never Fail Pencil Eyeliner. 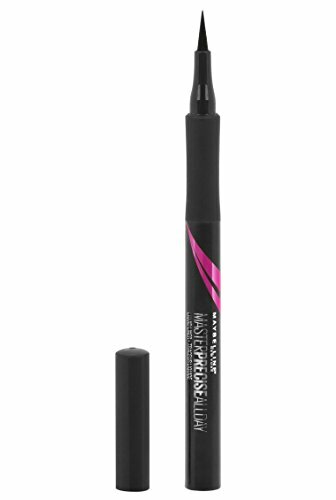 This eyeliner is extremely long-lasting, with up to 16 hours of duration. The liner is formulated to glide easily across your skin and apply evenly, which eliminates many of the problems pencil eyeliners tend to have. The liner is rich and creamy, providing full coverage and a rich tone. You don’t have to worry about skipping or the color bunching up. Many customers reported that this eyeliner was extremely smooth and easy to apply. This pencil also comes with a built-in smudger to diversify your eyeliner look. With this eyeliner, you get complete control of your look. To help you get the most out of your pencil, this eyeliner comes with a built-in sharpener that actually works. It is also smudge-proof, so you don’t have to worry about it messing up half-way through the day. There are many different shades available, some which only differ slightly. For example, you can buy black or carbon black – the only difference is that carbon black has some blue undertones. There is even a white shade option. Do note: this eyeliner is not waterproof, but it does have quite a bit of staying power. For the budget-conscious consumer, this eyeliner is a great option. The Rimmel Exaggerate Eye Definer goes on smooth and produces a deep color. Unlike some other eyeliner pencils, this one does not skip or leave an uneven color. The tip is small for accurate application, and the pencil comes with a built-in sharpener. No need to search for a sharpener or deal with a dull pencil. There are over nine different colors available, so you’re sure to find something that fits your style. From the “blackest black” to “emerald sparkle,” they have a shade for every occasion and look. The pencil is formulated to subtle blend or design precise lines. No matter your look, this pencil has you covered. 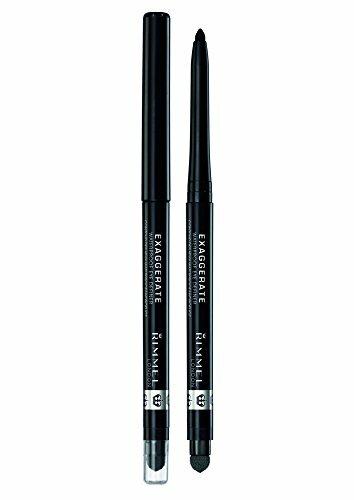 While this eyeliner is less expensive than much of the competition, it is still great quality. However, it is not waterproof like some of the others, and it is not as long-lasting as some other brands. For most people, this eyeliner should last the majority of the workday. If you want something to last a full twelve hours though, you should purchase one of our other picks. Some customers also reported that the pencil was not dark enough, especially on their waterline. With that said, many customers did love the variety of different color options and stated that most of them looked wonderful. If you prefer liquid eyeliner, this one is for you. Designed to be long-lasting and precise, stila Stay All Day Waterproof Liquid Eye Liner is a wonderful option for those who prefer liquid eyeliner. This eyeliner has a very fine tip and is designed to apply smoothly, allowing you complete control over the application. Whether you’re applying winged tips or classic liner, this eyeliner will work for you. It is also smudge-proof and fade-proof, so you can safely expect it to last all day. There are multiple different colors available, but not quite as many as some other liners. If you want an unusual color that isn’t black or brown, you’re going to have to look elsewhere. While this eyeliner is nearly perfectly formulated, many customers have had a problem with the bottle itself. There are some reports that the small, plastic insert that prevents too much liquid eyeliner from covering the brush has a tendency to break. While this doesn’t render the eyeliner unusable, it can make it somewhat more difficult to apply the liner evenly. Of course, not all customers are reporting this problem. If this sounds like a problem that could really bother you though, we suggest you choose our top pick instead. With that said, in all other areas, this liquid eyeliner is a wonderful choice. It goes on evenly, doesn’t fade, and is very precise. This eyeliner pen is designed to withstand large amounts of water. The Docolor Waterproof Eyeliner Pen is designed to deliver precise, sharp lines and intense color. If you enjoy trying new eyeliner styles or regularly wear complex makeup, you might want to give this eyeliner a try. It is perfect for winged eyeliner and smoky eyes. It is also designed not to smudge and last up to 12 hours under normal conditions, allowing it to last all day long without reapplication or touch-up. Many customers even reported that sleeping in this eyeliner didn’t make it come off. With that said, this eyeliner does seem to stay a little TOO well. Some customers reported that they had difficulty getting it off with a makeup remover. The ultra-fine tip allows you to create thin, precise lines. The applicator tip is designed to slide smoothly and produce even coverage, letting you easily apply the liner in whatever style you wish. As you would expect, this eyeliner is also waterproof and smudge-proof. It is truly long-lasting and can withstand many conditions other eyeliners just can’t. Whether it’s raining outside or you’re planning a day at the beach, this eyeliner has you covered. This eyeliner only comes in two different colors though – black and brown. For a larger variety of colors, you should look at one of our other top picks. For most people who regularly wear make-up, eyeliner is necessary to complete the look. Without eyeliner, it is hard to draw any style together, especially if you’re going to use other types of make-up that are applied to your eyes, such as eyeshadow and mascara. Without eyeliner, your eyeshadow can develop an obvious gap near your lashes, and your mascara will not look as dark as it could. Of course, it really depends on what style you’re going for. Some more natural makeup kits don’t require eyeliner to look complete. Eyeliner is also very versatile. You can make multiple looks with only one stick of eyeliner, which can not be said for many other types of makeup. For example, you can put use a classic, subtle style for your day job and then a dramatic, cat eye look for nightlife – all with the same eyeliner. A good stick of eyeliner should be able to do multiple jobs. Of course, it is always a good idea to have multiple shades of eyeliner available so you can more carefully match it to your style and eyeshadow choice. Precision. Most eyeliner styles require a steady hand and precise lines. Eyeliners with large, unprecise tips are harder to use and can make certain styles impossible. We recommend purchasing an eyeliner that is easy to use with a thin yet durable tip. If you choose a pencil eyeliner, you should also ensure that it has a sharpener on it that actually works. While pencils usually come with a fine tip, it can quickly get worn down with use. If you need help with precise application, you can try a handheld mirror. Long Lasting. When you put eyeliner on, you expect it to last. No one wants to have to regularly re-apply their eyeliner throughout the day. Luckily, finding an eyeliner that is formulated for long duration isn’t that difficult. All of our top picks are designed to last all day. Smudge-proof. Nothing looks worse than smudged eyeliner. It can ruin your perfect eyeshadow design and require you to completely re-apply your makeup. Choosing an eyeliner that is designed not to smudge is incredibly important. Waterproof. It is difficult to find an eyeliner that is completely waterproof, but most can withstand at least a little water. If you plan on encountering lots of water, we recommend something specifically designed to be completely waterproof. Most waterproof eyeliners are also longer lasting than other formulations. Even if you don’t necessarily need a waterproof eyeliner, it would not be a bad idea to purchase one. Color. The main purpose of eyeliner is to provide a defined line of color. Most of the time, eyeliners are black or brown, but there are also quite a few cases of blue, green, and even white eyeliner as well. Make sure to buy an eyeliner that fits the color you want to use. Most people have multiple shades of eyeliner available for different looks, so it helps if your chosen brand of eyeliner comes in a variety of colors. Of course, you should also make sure the color the eyeliner produces is vibrant and rich. The last thing you want is a dull, pale eyeliner. What does eyeliner do to your eyes? When applied appropriately, eyeliner should not damage your eye. Of course, there is always a risk of damaging your eye when you get something close to it, which is why you should not try to apply eyeliner in a car. If you’re particularly worried about infection, we do not recommend applying eyeliner to your inner eyelid or waterline, as this posses more of a risk of infection than applying the eyeliner on your outer lid. Do I need to wear eyeliner? Do you have to wear eyeliner with mascara? You do not need to wear eyeliner if you don’t want to. It is a completely optional part of wearing makeup, though it is a major part of many styles. Some people do not wear eyeliner because applying it makes them comfortable or causes their eyes to water. If this describes you, there is absolutely no reason to force yourself to wear eyeliner. Lots of people also wear mascara without eyeliner. This gives you a more natural look and makes it look like you’re wearing less makeup in general. Of course, whether or not you wear eyeliner most falls to your personal preferences and what style you’re aiming for. If you’re going for a more dramatic look, eyeliner can help, however, especially if you’re wearing mascara. The same is true if you’re wearing fake eyelashes. Should I wear eyeliner on the top or bottom? When most people wear eyeliner, they wear it on at least their top eyelid. Some people might also use it on the bottom eyelid, though you will be hard pressed to find a style that uses eyeliner on only the bottom lid. If you’re going for a more natural look, using eyeliner on that upper lid only is sometimes the better option. For a bolder look, use it on the bottom lash as well. Contour kits can also help with a bold, makeup-heavy style. How do you apply eyeliner? To apply eyeliner, you should begin at the inner corner at work across. Apply the pencil or liquid smoothly, aiming for a thin line rather than a thick one. It might help to pull your skin tight when using eyeliner. However, this can also cause you to use too much eyeliner, so experiment to figure out what style works best for you. If you decide to apply eyeliner to your bottom lid, pull your skin tight and gently apply the eyeliner over your lashes. We do not recommend applying eyeliner on your waterline because it often causes the eyeliner to migrate into your eye, which can increase the likelihood of infection. One of the most difficult things about applying eyeliner is getting both eyes even. This is why we recommend starting with a very thin line. It is easier to add eyeliner to make both eyes even than to take it away. Once you’re done applying your eyeliner, you can continue to add more to suit your preference and style, being careful to keep both eyes even. If one side starts to look thicker than the other, add more to the thinner side to get them as even as possible. We looked at 20 other eyeliners as well. Even though these didn’t make our 5 top eyeliners list, they’re the best of the rest, and each is still a great option. The information you’ll need to compare each one is included with the listing. This eyeliner goes the extra mile in helping you look good. It is infused with eyelash growth serum and castor oil to help your eyes pop even after you take it off. This long-wearing, no-smudge eyeliner has a flexible tip that makes it easy to apply. For a thinner line, lightly brush your lash line with the tip of the brush and for a thicker line, use the side of the liner with more pressure. Formulated without parabens, sulfates, synthetic fragrances, synthetic dyes, petrochemicals or phthalates. The small brush tip makes this easy to apply a precise line but calls for a steady hand. While it does have a controlled and continuous flow, it is best utilized if you line your eye in pencil first, then use this product. This dermatologically tested eyeliner lasts at least 12 hours and can create either ultra-fine or dramatic lines. The fiber tip applicator also provides control for a quick and easy application. This product has a uniquely thin and tapered felt-tip applicator that gives you careful control over subtle strokes and bold lines. 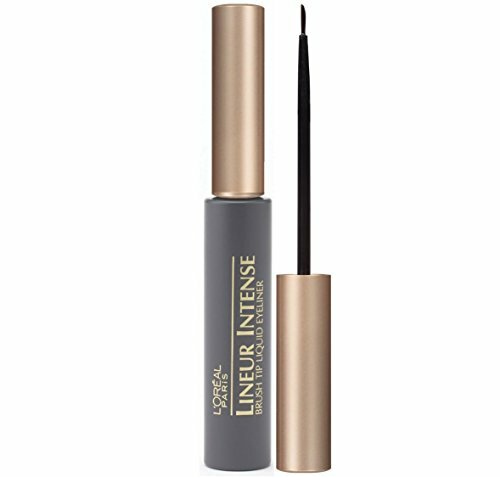 Customers say although it is not waterproof, it dries fast for a liquid liner and has a very matte finish. For a glossy look with intense shine, this eyeliner glides on smoothly for precise lines and designs. It comes with a flat brush and lasts up to 24 hours. This highly concentrated eyeliner holds pigments in a clear gel base that is safe for sensitive eyes and contact lens wearers. It sets instantly and glides on easily. This mechanical eyeliner swivels up and down, so the point always stays sharp. It is ophthalmologist tested and comes in a 2-pack which makes it a great value. Featuring a slender and supple brush tip, this intensely pigmented pen lets you achieve effortless, controlled lines. This creamy gel eyeliner kit comes with 2 classic colors that can be used for both eyelashes and eyebrows. It also provides 2 small eye makeup brushes, one regular liner brush and one angle liner brush that help you easily create different eyeliner styles. The kajal used in this formula is a richly intense black ingredient that delivers stunning definition. Because of its versatility, you can drill down the tip of this eyeliner to a blunt edge for a polished point or dull it on your hand for a softer smear. This eyeliner set comes with 24 diverse colors which makes it an excellent value. Customers say they are smooth and easy to apply. Even though you have to sharpen this eyeliner with a regular large pencil sharpener, customers say that it does have great durability. It is easy to apply and can be used as both eyeliner and eyeshadow. Customers say this product is easy to smudge or blend, but equally as easy to draw a thin line. It is also easy to sharpen and comes off effortlessly with soap and water. With this product, simply line up the stamp from the corner of your eye to the end of your eyebrow to create the same wing on each side. The other side has a very fine tip for defining the rest of the eye with precision. This dual-ended winged eyeliner stamp comes with a well-inked pigmented stamp on one end and a fine liner on the other. They suggest using an eyeshadow primer before applying if you have oily or combination skin. This easy stamp doesn’t require any filling or lining and gives you a perfect eyeliner wing in seconds. This long-lasting winged stamp is available in 3 different sizes depending on how thick you would like it to be. Even with shaky hands, you can simply stamp and line for a dramatic look. The ingredients included in this winged eyeliner stamp are candelilla wax, and carnauba wax which ensure the liquid dries quickly and holds on strong. Customers say it is very smooth and convenient to use.